Crowjy sleeps up to 5 guests. This stone cottage was originally an outbuilding for Ardevora Farm & Mill - hence its name 'Crowjy' - which translates from the Cornish word for cottage/shelter/shed. It now boasts light, airy and well equipped holiday accommodation. Bedroom 1 has a king size bed and ample bedroom furniture. Bedroom 2 (the family bedroom) has 3 single beds and again plenty of drawer and hanging space. The bathroom is 'wet style' and fully tiled with a shower, basin and toilet. The living area is made up of a large kitchen with all mod cons, a spacious dining area (seating 6) and a comfortable lounge with sofa's, TV and DVD player. To the rear of the cottage is a large patio and grassed area (shared with the adjoining cottage) with far reaching countryside views. To the front there is a gravelled driveway, with ample parking and a patio. There is also a separate laundry room with washing machine and tumble dryer, which is for exclusive use of our guests. 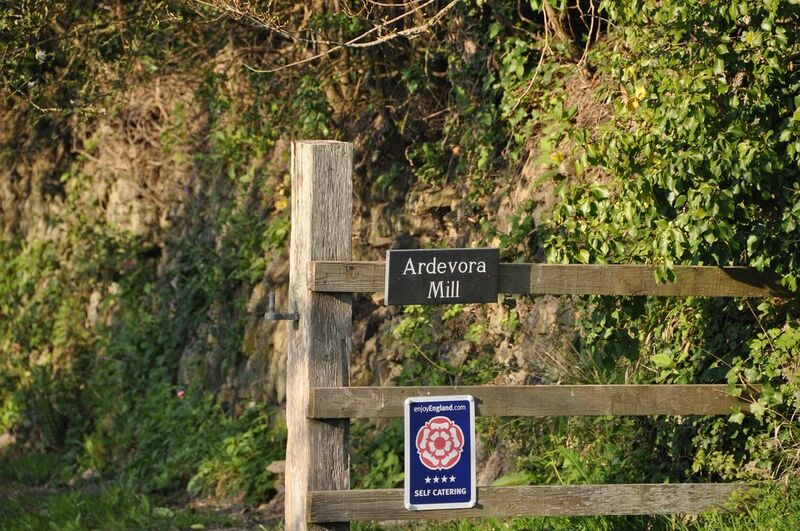 Ardevora is a hidden gem, tucked away in the heart of the Roseland Peninsula an area of unspoilt natural beauty. A perfect place to relax, unwind and enjoy the best of Cornwall. Our 3 stone cottages have been lovingly transformed to provide the best possible year round holiday accommodation. Sleeping 2, 4 or 5 guests and with the ability to join two of the cottages together for larger parties. Approached down a 3/4 mile farm track with stunning countryside and creek views, our stone cottages offer modern accommodation & amenities and are well equipped, spacious and spotless - which is reflected in the 4 star, Gold quality rating we have been awarded by enjoy England. Being tucked away ensures a peaceful and secluded location, however we are still accessible to the myriad of wonderful attractions Cornwall has to offer. Nearby is also a great choice of quiet unspoilt beaches; spectacular coastal walks; pretty hamlets and villages and an abundance of water sports. shower, A wet style shower room, with non-slip tiled floor. Every room has the luxury of underfloor heating which is controlled by thermostats in each room. There is a separate laundry room for the use of our guests, with a washing machine, tumble dryer and sink. There is no additional charge for this, but you will need to supply your own washing powder. We have plenty of parking alongside the cottages. It is gravelled and flat. Towels are provided, however we do prefer our towels stay in the cottages so we ask you to bring your own beach towels. Crowjy has a comfortable living area, with a TV and DVD player. Our kitchens are fully equipped. We have the usual fridge, freezer, microwave, dishwasher, oven, hob, toaster, etc. but we also have most, if not all, the utensils you will need during your stay! With plenty of crockery and cutlery for the 5 guests this cottage can sleep, along with any visitors they might have. The dining area leads straight out to the back garden. There is a variety of reading books and tourist information books available. There a some games and jigsaws available in the cottage to help keep our young guests entertained. The large back garden is shared with the adjoining cottage (Ardevora an Gylen). The views across the countryside are beautiful. We have three kayaks which can be used on the creek. We also have buoyancy jackets available. We make a nominal charge for this. There are lots of cycle routes in the area and bikes can be hired from nearby. Cornwall has many stunning golf courses, all within fairly easy reach of our cottages. There are too many to mention, but hopefully these two will provide you with a flavour of what is available. The Carlyon Bay Golf Course is a stunning 18 hole championship golf course - a treat for keen golfers. About 16 miles drive. Truro Golf Club, is a mature course set in a superb landscape. Gently undulating and easy walking countryside, populated by mature trees, this course provides both a challenging test for low handicap players and enjoyable golf for all. About 16 miles drive. If you require a private chef during your visit, or would like freshly cooked food delivered to your cottage for either your arrival day or during your stay then please contact us. Carne & Pendower (2 miles from cottage) - these two beaches become one at low tide, both sandy with rock pools, parking, toilets and refreshments available. Porthcurnick (3 miles from cottage) - a lovely sandy cove with loads of rock pools, toilets & cafe. Ample parking a few minutes walk away. The nearest airport is Newquay (45 minutes). Further away is Exeter airport (2 hours) and Bristol airport (3 1/2 hours). Rail service from London Paddington stops at St Austell and/or Truro and takes about 5 hours. A car is essential for holidays at Ardevora and can easily be arranged in advance, however if you need any help in sorting car hire please contact us on 01872 501991. Portscatho - 3 mile - fishing village & beach. Veryan - 5 mile - cornish village & roundhouses. St Mawes - 7 mile - picturesque village, harbour, castle, passenger ferry to Falmouth. Eden Project - 24 mile - global garden housing the largest indoor rainforest. Truro - 14 miles (9 mile via ferry) - bustling cathedral city. Good shopping and plenty of lovely places to eat. Lost Gardens of Heligan - 10 miles - world renown restored garden. Booking Notes: Bookings can be provisionally made by telephone or email. Confirmation is given when booking form and deposit payment is received. Full Booking Terms & Conditions are available on request. Changeover Day: Changeover day is Sunday for Crowjy & An Gylen. Vean has a Friday changeover. Short breaks are often available, please contact us to discuss 01872 501991. Arrival time 4 p.m. onwards. Departure time by 10 a.m. Notes on prices: Couple discounts are sometimes available, by all means contact us to discuss 01872 501991. Late booking discounts are also sometimes available for bookings made within two weeks of arrival - again please contact us to discuss 01872 501991.